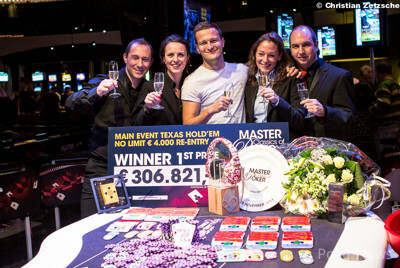 Ruben Visser Wins the 2014 Master Classics of Poker (€225,000)! After a long, grueling day, and with the casino getting ready to close, Ruben Visser beat 2011 Master Classics of Poker Main Event winner David Boyaciyan to prevent the latter from becoming the first two-time champion in the event's history. With just 35 minutes left before the casino would be forced to close for the night and the remaining players left to return for an additional fifth day of action, Visser sealed the deal after just two hands of heads-up play. At the time, both players were virtually even in chips with 55 big blinds, but it was over in the blink of an eye. 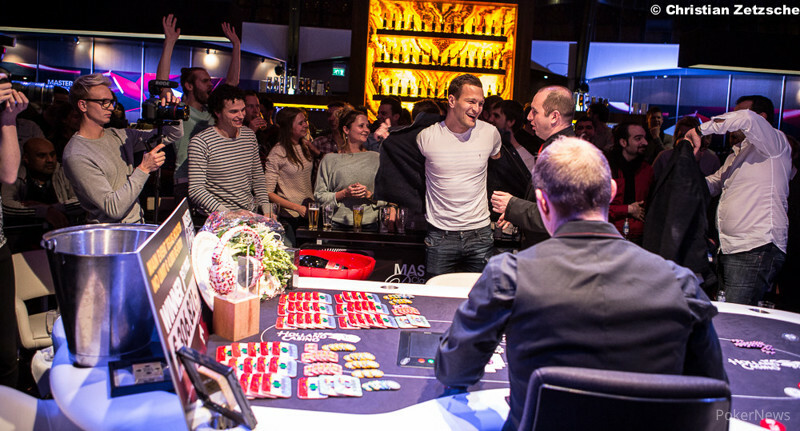 Visser won a big four-bet pot on the first hand before finishing off his compatriot on the next hand. Visser and Boyaciyan had done a deal during three-handed play with third-place finisher Andrew Chen. That deal allowed Visser to take home €200,000, Chen €190,000, and Boyaciyan €178,000, with €25,000 left for the winner. Even after this deal was done, there was no playing soft, as all three were still desperate to land the title — particularly Boyaciyan who had the chance to make history. It was not to be, though, and Visser claimed victory. The day start off with a bang as defending champion Noah Boeken was eliminated in the very first hand. The Dutchman pushed with the , but found fellow former MCOP winner Ole Schemion with the . The board ran out to put the tournament on the bubble of the final table. Stuart Rutter was eliminated on that bubble, pushing with the and finding Jussi Nevanlinna prepared to give him a spin with the . 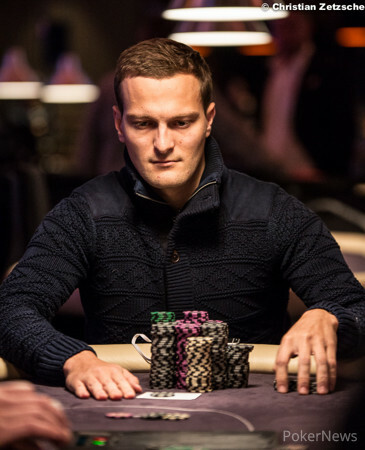 Neither player hit the flop or the turn, but the river sent Rutter back on a plane home to London while everyone else set up for the final table. [Removed:17] was the first player knocked out of the final table when he pushed with the into Boyaciyan's . Yan managed to spike a queen on the flop, but couldn't improve any more than that. Visser then knocked out Hzarem Aanquich in ninth place when he held a premium hand in the . Aanquich was doing better with the , but an ace on the flop sealed the deal. Steven van Zadelhoff was the third player out from the final table, after he had gotten short and was looking for a spot to shove. Unfortunately for the man with the remarkable beard, he shoved the right into Boyaciyan's . One brick-filled board later meant another Dutch player was eliminated. Play then continued seven-handed for a while before Visser shoved on a short-stacked Ole Schemion. The German called off with the , but Visser's was live and hit the board better. Schemion, the former MCOP champion back in 2012, added yet another final table to his growing list of achievements, but he wasn't able to notch another win. 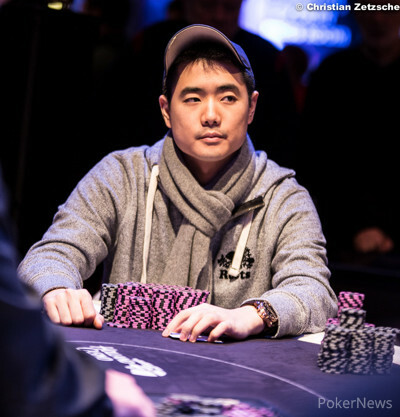 Short-stacked survivor and recreational player Robbie Hendriks laddered up to sixth place before pushing with with the into Chen's , and then it was Nevanlinna who was an unlucky in fifth place when his lost to Clyde Tjauw Foe's after a ten hit the flop. The four remaining players continued for about two and a half hours with no one gaining too much of an advantage until Visser won a crucial, huge flip against Tjauw Foe. Tjauw Foe was crippled with less than two big blinds and eliminated on the very next hand. After that, the deal was struck between the remaining three players, but Chen suffered a big cooler and was knocked out in third. Heads-up play started out almost even, but it was all over just two hands later with Visser becoming the 2014 Master Classics of Poker champion. Next on the European schedule for PokerNews will be the European Poker Tour event in Prague, and we hope to see you there! Ruben Visser raised to 180,000 on the button and David Boyaciyan made it 480,000 in the big blind. Visser called in position to see a flop. They both checked and saw the turn. Boyaciyan checked again and Visser bet 580,000 which the former called. The river was the and Boyaciyan checked, Visser moved all in. Boyaciyan tanked for about a minute then dropped his chips in. Visser immediately turned over and Boyaciyan mucked (later telling us he had . Immediately Visser ran across to his fans to high-five all his supporters. Meanwhile former MCOP champion Boyaciyan will be disappointed not to be the first two-time champion but he'll still be taking home a huge second-place prize. David Boyaciyan raised to 200,000 on the button and Ruben Visser made it 450,000 in the big blind. Boyaciyan responded with a four-bet to 850,000 and Visser flat-called for a huge opening heads-up pot. With over 1.7 million already in the pot, the flop came and Visser quickly checked while Boyaciyan checked behind him. Visser also checked the on the turn and so did Boyaciyan. The hit the river and Visser fired a bet of 680,000. Boyaciyan called and Visser showed for two pair. Boyaciyan mucked and Visser took a big chip lead early on in this battle. The two remaining players are almost dead-even in chips and there's 35 minutes left in the level. Can Ruben Visser come out ahead or will David Boyaciyan become the first person to ever win two MCOP titles? One thing is certain, the winner is Dutch. Play begins in about ten minutes. David Boyaciyan raised to 200,000 on the button and won the blinds and antes. Andrew Chen shoved in the small blind for 1,045,000 and David Boyaciyan folded in the big blind. David Boyaciyan raised to 240,000 in the small blind and Ruben Visser announced all in from the big blind. Boyaciyan counted his chips but ultimately elected to fold. David Boyaciyan raised to 240,000 on the button and Andrew Chen moved all in. Snap call. The board ran out and although Chen made trip jacks, they were no match for Boyaciyan's trip queens in a cold deck hand. Prior to three-handed play, the three remaining contenders for the MCOP title in the Holland Casino agreed on a deal and they are still playing for €25,000 and the winner plate. First David Boyaciyan raised to 200,000 from the button and won the blinds and antes. In the next hand, Andrew Chen raised to 160,000 on the button and called the three-bet of Boyaciyan out of the small blind for 380,000. The Dutchman quickly bet 280,000 on the flop and Chen's card were sent into the muck. Andrew Chen raised to 200,000 in the small blind and David Boyaciyan called to see an flop. Chen checked and Boyaciyan bet 175,000, Chen quickly folded. 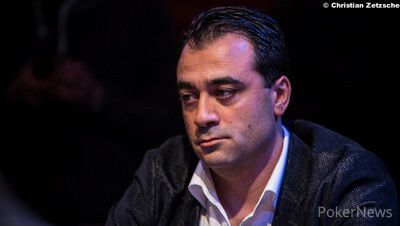 David Boyaciyan raised in the small blind and Ruben Visser folded in the big blind. Ruben Visser limped the small blind and Andrew Chen checked. The board of was checked to the river where Chen's was good. A couple of hands later Chen opened shoved for just over 1.5 million from the small blind and Boyaciyan folded. Ruben Visser raised to 170,000 from the button and Andrew Chen called in the big blind. The Canadian check-called a bet of 140,000 on the flop. On the turn, Chen checked again and Visser fired a second barrel worth 340,000. 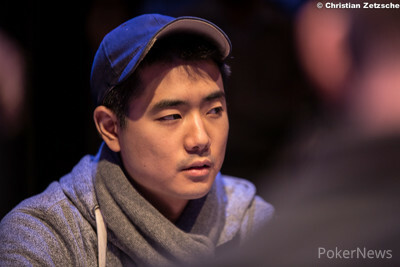 Chen check-raised to 1,000,000 and Visser then moved all in for more than three million in chips with the superior stack. Chen sighed and then threw his cards into the muck, triggering cheers from the mostly Dutch rail. Visser now has more chips than his two opponents combined.